Online Continuing Professional Education (CPE) provider CPEThink.com and leadership and personal development company LIFE Leadership have announced a new course option covering LIFE Leadership’s ‘Financial Fitness Pack’ materials that will earn CPA professionals twenty-two self-study CPE credits that meet or exceed the AICPA/NASBA standards activated in 2014 for all 50 states and US territories. Financially fit people are avid readers and consistently invest in themselves by increasing their financial and leadership education, skills, experience, knowledge, and ability. CPEThink.com and LIFE Leadership have announced a new self-study option that is available to CPA professionals, including general practitioners, licensed professionals, Certified Public Accountants (CPAs), and others, who are working to fulfill their Continuing Professional Education (CPE) requirements that will help them maintain their professional competence and their ability to provide quality professional services. In order to retain their certification, all accounting professionals are required to earn a certain amount of CPE credits that satisfy the standards jointly issued by the National Association of State Boards of Accountancy (NASBA) and the American Institute of Certified Public Accountants (AICPA). CPEthink.com is an IRS-Approved Continuing Education Provider registered with NASBA as a Quality Assurance Service (QAS) Sponsor of Continuing Professional Education. Founded by CPAs, university professors, lecturers, and information systems professionals, CPEThink.com says it aims to empower accounting professionals by offering flexible, industry-leading online interactive self-study CPE courses and exams at a reasonable price. 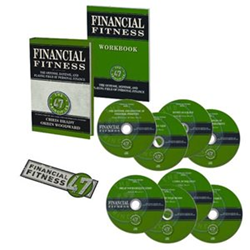 This newest course option will enable CPA professionals to earn twenty-two self-study CPE credits by completing the materials in LIFE Leadership’s ‘Financial Fitness Pack’ (a ‘Financial Fitness’ book and workbook plus eight audios) and passing an online exam covering the material. The CPE credit hours earned satisfy or exceed the updated AICPA/NASBA guidelines on self-study CPE activated in 2014 for all 50 states and US territories.